This is my first pastel painting as well as my first time using a velour paper. It was pretty scary, because I was using the “good stuff” on a practice run using student grade soft pastels with artist grade thrown in the mix. I didn’t see much difference between the student grade and the artist grade (shhh, don’t tell anybody) really I didn’t…it may have something to do with not having any experience in the medium but both kinds had rich colors and went down the same. A problem I did have was that I put my lights in first then the darks and midtones. It was hard to blend in and I think (at least in this instance) that I should have went from dark to light then add the detail. I couldn’t get as much fine detail as I would’ve liked, but I know what to do next time. Now the paper? My goodness it was beautiful! I used Hehnemule Velour paper and it felt like I was drawing on fabric..it’s that soft, pliable and thick. I see why a lot of artists use it. I picked a color that was almost the same color as the brown in the Lab’s ear. 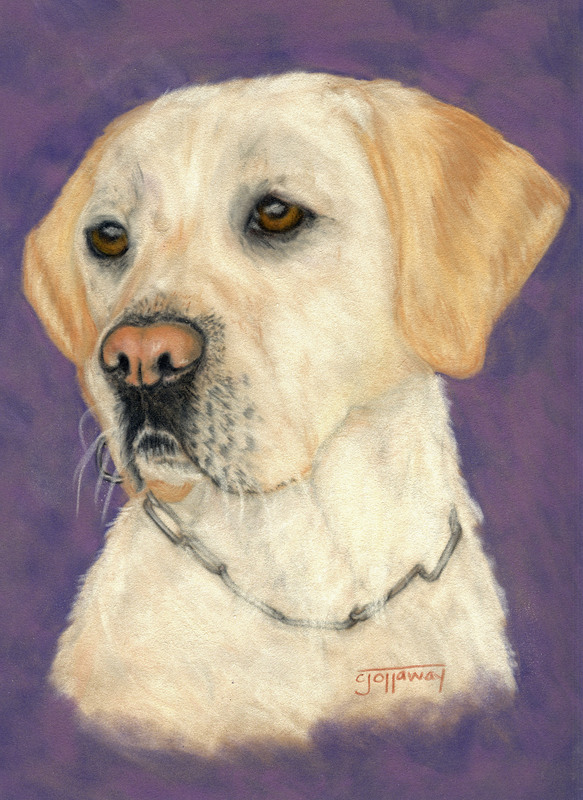 The color was just too close and washed out the whole portrait, so I chose a purple pastel as the compliment color. I have to say that I don’t care much for the background and I wish I were a little wiser about choosing a paper color…BUT Live and learn:) Also, you can’t use a fixative on this paper..so I had to wrap the drawing in tissue.. Overall, I really liked using pastels, and I hope to become more acquainted with this medium in the future. What a beautiful painting. I recently bought some pan pastels, but in very limited colors. I’m dying to try them and now that I see your results with pastels, I am feeling hopeful that I will love them. Awwww, it looks a lot like Stanley! if you got any more fine detail it would be able to jump out of the picture. Lovely work and the velour paper just allows for the depth which you manage to achieve almost effortlessly ( I know it may not seem that way…but it looks that way 😉 ). I do like hahnemuhle too and haven’t used it for ages…but, in my experience, light to darks works best. But, I have only ever tried CPs on it and not pastels. Vicki – Thank you! Give your pan pastels a try…You’ll love them! Vicki W. – Thank you! Is Buddy still around? Mrs. Ottaway – You are so funny! Thank you! Chrissy – Thank you! I read and lurk around on Wet Canvas, but I stopped participating a long time ago. Had a couple of bad experiences from a couple of posters (they were asses)…so I don’t bother. Thanks for the heads up…from light to dark….I pulled the piece back out..and I overworked the paper and I think that may have been the problem. I’ve seen a bunch more uglier dogs than that. That is beautiful.